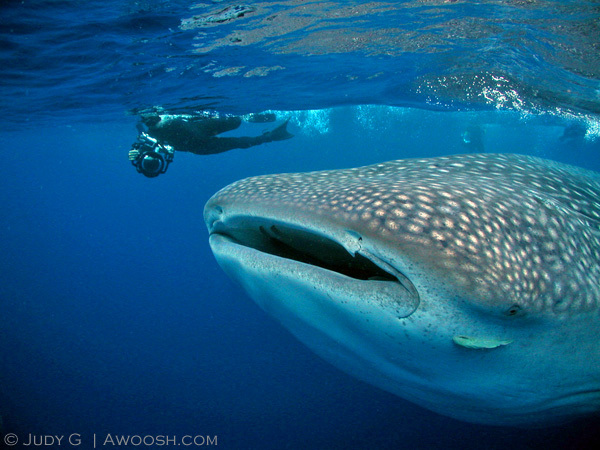 ← Scuba Diving Magazine Feature: Where in the World is Wallace? Thursdays seem to have become the day for dredging up images from the past. This past week I had a query from my cousin in New Zealand about the Galapagos, which he hopes to visit (and dive) next summer. In addition to giving him some info and links to resources, I also directed him to an experiential photo essay I put together from my first trip there in 2003 – which was one of the first photo essay style trip reports I ever cranked out. It was well received on the Scubadiving.com forum where I shared it, and so motivated me to continue to shoot pictures, write about them, and share my stuff. So, it’s a bit of an oldie – but hopefully a goodie. I’d like to think I’ve come a fair ways as an underwater photographer since these early days with a camera, but the image I shared above, of Twang and the Whale Shark, which was shot on this trip with an Oly 4040Z digicam, remains one of my favourite images to date. And I would love to go back to the Galapagos again, before my arse gets too old to do this kind of adrenaline diving. This entry was posted in All About Scuba Diving, Galapagos Travel, Photography, Pic of the Day, Travel, Trip Reports, Writings and tagged Galapagos, Whale Shark. Bookmark the permalink.